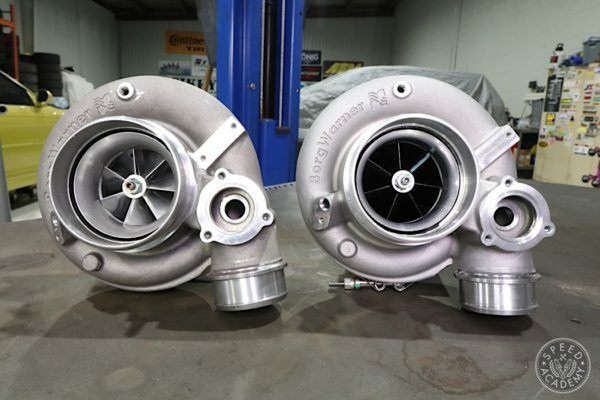 We posted a press release from AEM Induction on our Facebook page a month or two ago and people were impressed and, in a few cases, skeptical about how big the advertised power gains were on the 2015 Subaru Impreza WRX STI (20-whp peak vs peak and 32-whp max gain). 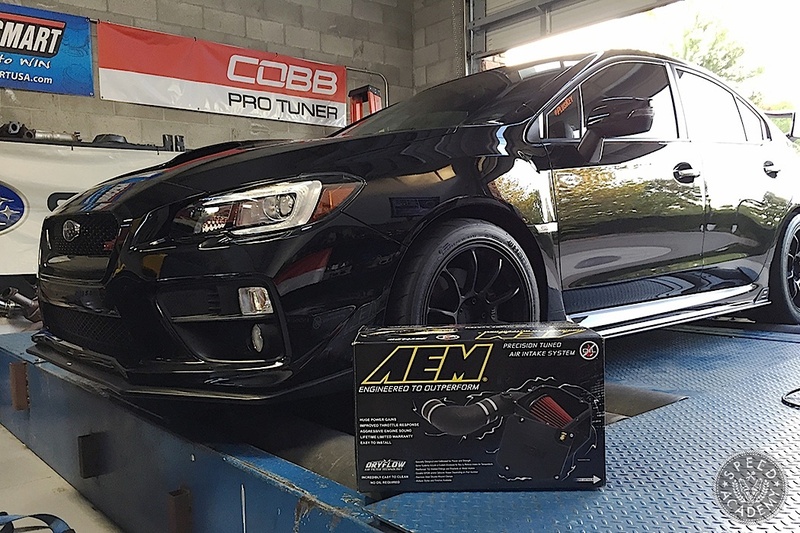 We wanted to put this new offering from AEM to the test, but we didn’t have a 2015 STI available, so we enlisted well-known Subaru Time Attacker and Cobb ProTuner Travis Barnes from Snail Performance to try it out on his shiny new daily driver. We first met Travis about 10 years ago, when he brought his bug-eye WRX out to a little track test comparo we were working on and let us hoon the crap out of it at Spring Mountain Motorsports Ranch. A few years later his Subie was well on its way to becoming the full-blown ‘Snail Racer’ you see above, having run it in the Modified Tuner Shootout with us and the good folks at NASA AZ. Travis did extremely well in the Shootout (4th overall) against some big shop-backed entries, and since then he’s grown Snail Performance into a highly respected Subaru tuning specialists in Arizona and California (Snail has a retail location and installation centre in the Phoenix area and Travis is now located in the Bay area of northern California and works his magic as a Cobb Pro Tuner on his “ego busting” Mustang dyno). 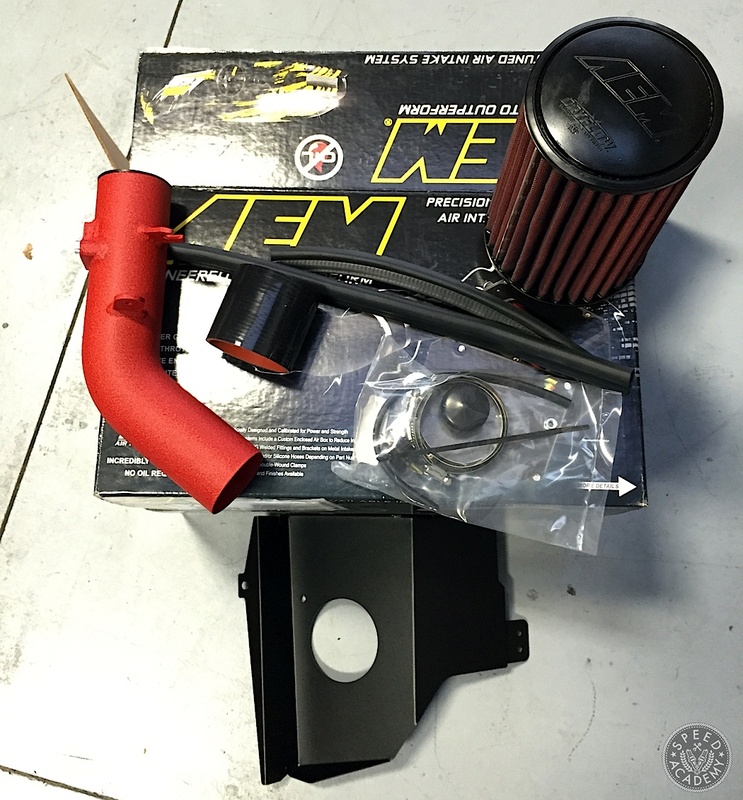 The AEM cold-air intake system for the 2015 STI, backed by a limited lifetime warranty, includes a black powdercoated aluminum heat shield that bolts up in the factory air box location and seals the filter off from engine bay heat, a mandrel bent intake tube (finished in either wrinkle-red like ours or wrinkle-black) that’s designed to accept the stock MAF sensor and uses stock mounting points for support, and a large Dryflow synthetic air filter that’s designed to be low restriction without compromising engine protection. The Dryflow filter is also washable and reusable and doesn’t require oil, so won’t foul the MAF sensor. And of course the kit also includes all the clamps and hoses needed for a quick and easy installation. 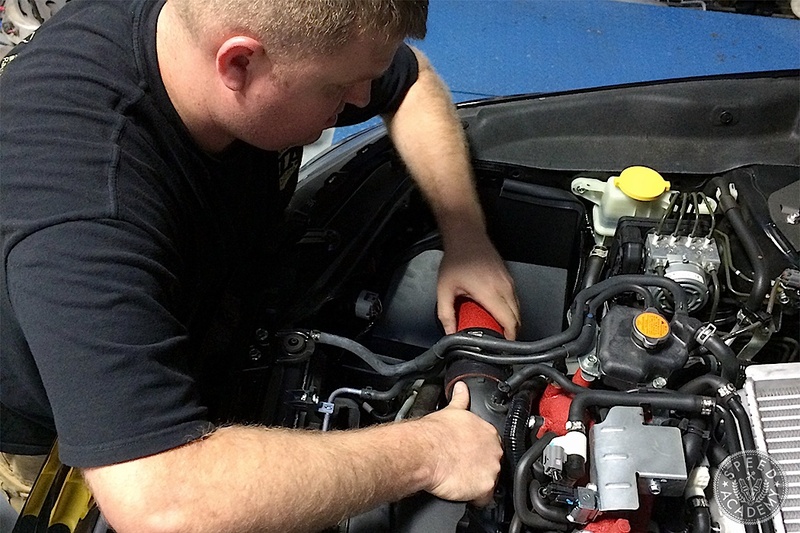 With the intake fully installed, it was time for Travis to strap his ’15 STI onto his Mustang dyno and see what sort of gains can be made. Don’t blink, because this one’s over in a hurry! (that’s what she said). 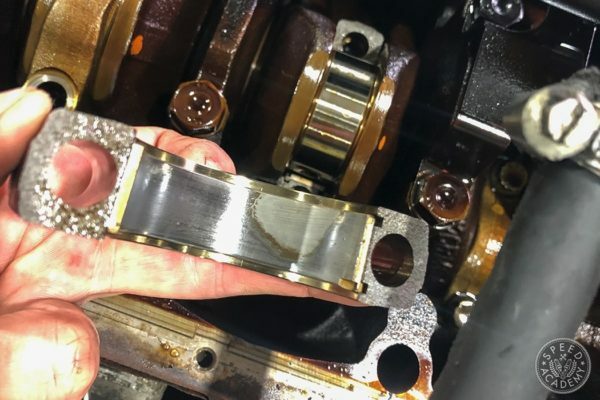 Before we get to dyno results, Travis did a couple of extra tests that reveal quite a lot about how the AEM system outperforms the stock air intake system. 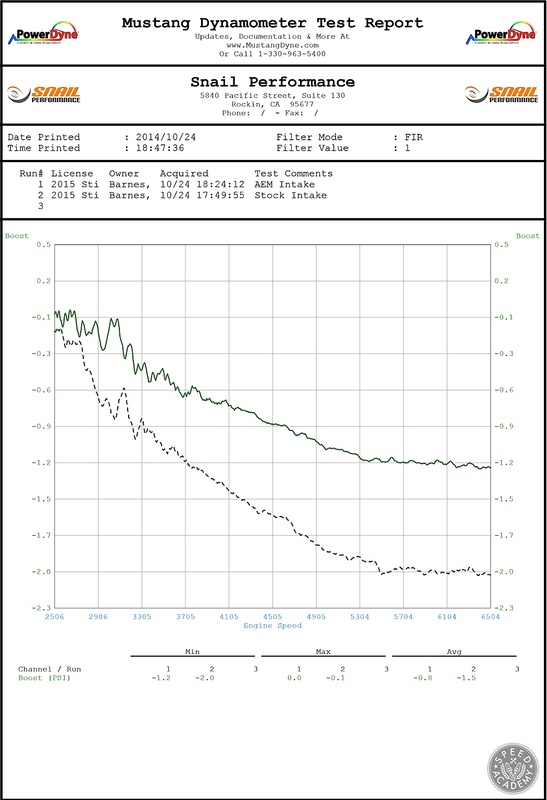 While on the dyno, he measured intake vacuum and intake air temperature, both of which produced intriguing results. As Travis explained, “A lot of the power with the AEM system comes from it being less restrictive. Less restriction means more air, and more air means more power! 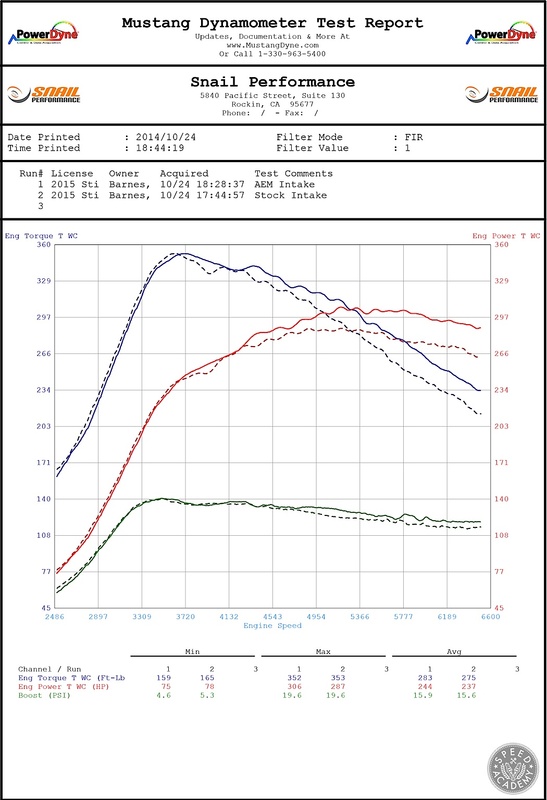 As a result, boost stays up a bit higher starting at 4700RPM because of this lower restriction level, as indicated by the fact that intake vacuum is around -1.2 psi with the AEM intake and -2.0 psi with the factory intake. So there you have it. 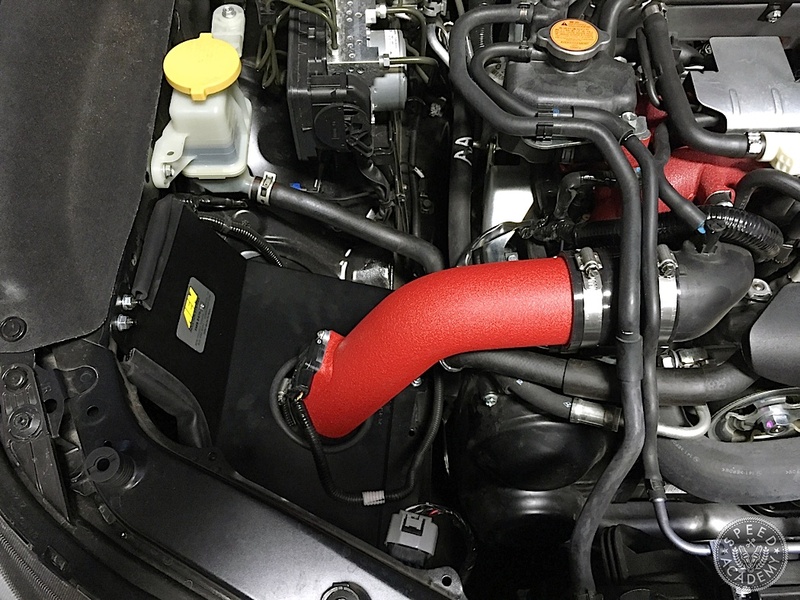 AEM’s 2015 Subaru Impreza WRX STI intake system lives up to the billing, not only producing the advertised gains but also greatly improving area-under-the-curve from 3,700 RPM to redline, improving induction noise, dropping intake air temperatures, reducing intake vacuum, and doing so with a very nicely finished package that enhances the appearance of the engine bay, too (we love the way the wrinkle-red coating on the intake tube matches the factory finish on the intake manifold). 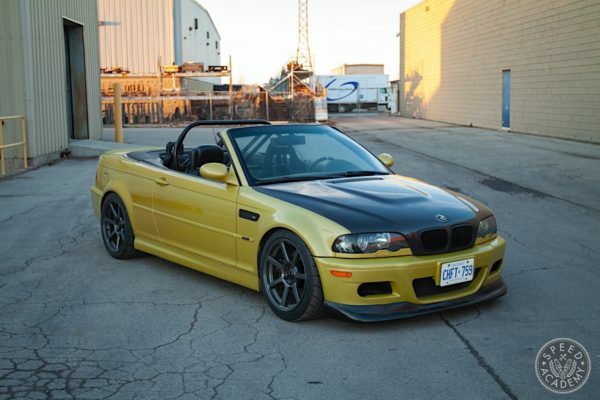 What wheels are those? They look awesome. Thanks for the complement on the car. The side skirts in the front lip available from Subaru as they are factory part. 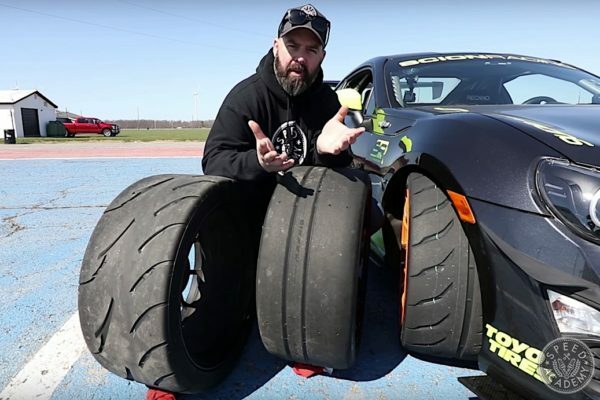 fuzaero those are the Volk Racing ZE40s…….drool worthy indeed! So this intake would be safe to run with the factory tune on otherwise stock car? Wouldn’t have to worrie about anything being damaged? Hello, do you have the dyno numbers before tune? I was under the impression the initial tests done by AEM were without a tune as stated stock. I would love to see the numbers without any tune verified.